Two years have passed since the bitter battle in which three young trainers joined forces to drive Team Rocket out of their Saffron headquarters. The gang's three executives have not surfaced since then and the current location of the TR leader is not known by any either. Today's another sunny day in Kanto. In the fields north to the southern town known as Pallet, a postman is having trouble controlling his Ponyta on his way to deliver the mail. The fire pony lets out a neigh and nearly throws its trainer off as it rampages along the grassland. The man notices a boy not far in front, and yells out in panick as Ponyta charges straight towards that direction. The boy, however, calmly pulls out a pokeball and releases a Venusaur, which strikes the fire pony with a stun spore and halts it immediately. The postman gets thrown off and is about to hit the ground when the Venusaur moves in just in time to catch him with the giant flower on its back. The postman thanks the boy for his help and apologizes for the erratic behaviour of his pokemon. He explains that he is there to deliver the mail for Pallet Town and wonders if the boy has heard of a pokemon trainer known as Red. The boy grins and says he is Red of Pallet Town. 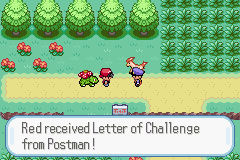 The postman bolts up with a start as he realizes he is face to face with the current champion of the Pokemon League. Red takes his mail from the man, then thanks him and runs off, with the man still gaping after him. He opens up the envelope and to his surprise, finds a letter of challenge inside. In the north-western region of Kanto, Bruno is facing off an Onix in the mountains. The huge man swings his nunchucks into a rapid twirl and hurls one of its end towards the wild rock serpent. A Hitmonlee pops out from the pokeball secured at one end of the nunchuck handles, and immediately delivers a powerful kick, knocking out the Onix in one hit. Bruno pants with sweat from all the hard work and Lorelei, who's sitting high up on a rock behind, comments that she's amazed how the man can always remain focused in training. Bruno remarks that strengthening the mind is just as important, and Lorelei chuckles that his brain will soon turn into muscles. The big man gets annoyed and asks what she wants. The young woman hops down from the rock and says that she has sent off a letter of challenge to the current Pokemon League champion, Red, under the name of Bruno, and that the boy will arrive soon. She reminds the man to test the boy for what Lance looks for, regardless of what he himself thinks of it. Bruno hesitates for a while and turns to leave without a word. One month later, at the research lab in Pallet Town, a busy Prof. Oak is talking with Misty via the visual phone system. The Cerulean gymleader is surprised to know that Red has departed upon receiving a letter of challenge a few weeks ago and remarks that she hasn't been able to keep in touch with him for a while. Oak says champions of the Pokemon League have always been the challenge target of many aspiring trainers in the country, and that he himself has been visited by plenty of strong trainers after his victory at the league many years ago. Misty gets worried and asks if the professor has heard from Red since his departure, but the old man assures her that Red and his pokemons have grown much stronger over the past two years and should be able to look after themselves. The only complaint Oak has is that the boy has not worked on completing his Pokedex much lately, and Misty wonders why the old man sounds so desperate about it. Oak explains that more and more new pokemons beyond the confirmed 151 species have been discovered. He is currently working on a new Pokedex and wishes to have the complete date of the first 151 pokemons readily incorporated into the new system. Misty sighs and says she has hoped to give some assistance to Red on his plan to sit for the gymleader selection, but decides that it might have to wait for now. Prof. Oak laughs and says the boy certainly is busy with all the challenges, Pokedex task, and preparations for the gymleader test. He remarks that Green and Blue have both departed on their own journeys as well and says the town seems quiet without the young trainers around. Misty then spots a letter on Oak's desk and gets curious about it. Oak explains that it is the latest letter of challenge Red received and is about to pick up and read through it when a faint tap is heard on the door. Oak quickly fumbles through his stuff for a plastic glove and Misty wonders what it is for. The old man explains that the door knob looks to be charged up with static electricity and says it happens every time Red's Pika taps on his door.